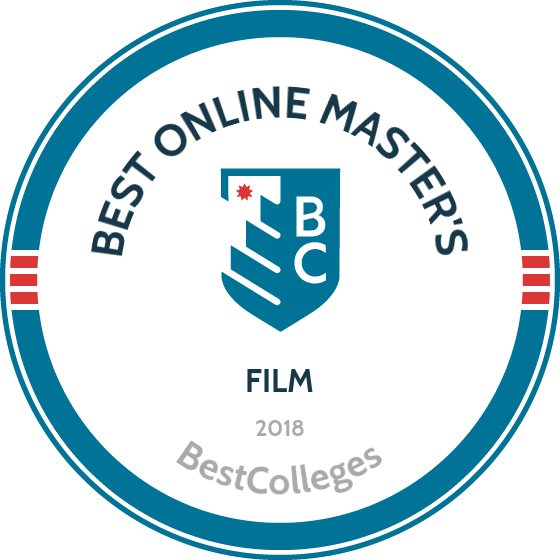 What Are The Best Online Master's in Film Programs? What Else Can I Expect from an Online Master's in Film Program? Film studies at the graduate level attracts creative thinkers who are interested in the history, aesthetics, and theory of film. Coursework for the academic study of film includes cultural, political, and philosophical perspectives on film genres, screenwriting, directors, production, editing, and cinematography. Schools with strong film studies programs provide a variety of interdisciplinary options that prepare graduates for success in this competitive field. If you are determined to have a career in the film industry, pursuing a master's degree can be a sensible choice for achieving advanced literacy in film studies, especially for postsecondary teaching careers. Graduates may also pursue opportunities in related communications fields, such as public relations and educational media. The U.S. Bureau of Labor Statistics (BLS) projects that jobs for producers and directors will grow by 12% between 2016 and 2026, which is much faster than average. Lipscomb, located in Nashville, Tennessee, offers two online film master's degrees: a master of arts in film and creative media and a master of fine arts in film and creative media. The MA degree is a 36-credit program that can be completed in 17 months, and which teaches students how to write for various types of media including music videos, commercials, and feature films. The MA degree also includes courses on film theory and criticism. The MFA degree is a 62-credit program that emphasizes writing and directing in a more narrowly focused area, such as film and television. During the second summer of the MFA, students travel to Los Angeles where they complete an internship while finishing up coursework, preparing a portfolio, and writing a final research paper. Applicants with undergraduate degrees in telecommunications, new media, multimedia, film, creative writing, or other related disciplines are preferred for both programs. Those without a communication background may be expected to make up any coursework deficiencies. Individuals without a communication background may be expected to make up coursework deficiencies. In addition to an application and fee, students must provide GRE or MAT scores, official transcript information, three references, a resume, and a sample video or personal statement to be considered. SCAD is a private, nonprofit university with several locations, including one in Savannah, Georgia. The school offers a 45-credit online master of arts in motion media design that trains students to become graphic designers, filmmakers, animators, and interactive designers. Additional intensive courses may be assigned to students, creating a program that ranges between 50 and 60 credits. The curriculum includes courses on topics like motion analysis and application, visualization and concept storyboarding, studio business practice, and dynamic topography. Students may also take part in a collaborative project with professional partners as they move toward careers in motion media design. Students learn about the history, concept, and theories of motion media as well as how to how to analyze and execute motion media themselves. Applicants must have an undergraduate degree and provide two letters of recommendations, a portfolio, a resume, a statement of purpose, and may need to supply GRE scores or take part in an interview. SCAD accepts applications year-round. Located in San Diego, National offers a 45-credit online master's degree in film studies that covers film theory and history as well as the fundamentals of film terminology, tools, and processes. The program trains students to critique films and their makers orally and in writing, while also applying film theory and history to American and international films and directors. Students pursuing this film studies degree online can go on to pursue a doctoral degree in film studies or teach film in a community college setting. The degree is also ideal for students interested in careers that require critical thinking and visual literacy. The curriculum includes courses on topics like silent film history, American film history, world film, international and domestic directors, and film genre studies. There is also a capstone course requiring a formal paper that students will submit for publication upon completion. Applicants must submit appropriate transcript information as well as test scores, evidence of professional experience, motivation, and educational goals to be considered. Regent is a school rooted in the Christian tradition that offers three online graduate degrees in film and television: a master of fine arts in film and television with a concentration in script and screenwriting, a master of arts in film and television with a concentration in script writing, and a master of arts in film and television with a concentration in producing. The MFA degree is a 44-credit program, while both MA degrees require 30 credits. The MFA in film and television with a concentration in script and screenwriting emphasizes the analysis and conceptualization of film, television, and video for future screenwriters, editors, university professors, and film critics. The curriculum includes courses on topics like writing the short film, playwriting, writing for television, as well as a hands-on practicum experience. The MA in film and television with a concentration in script writing facilitates understanding of meaning and structure for stories on screen and stage. The MA in film and television with a concentration in producing emphasizes the steps of developing and producing creative projects through coursework on marketing, finance, distribution, and management. CCNY is a private Christian university that was founded in 1881 in Bronxville, New York. The school offers a master of arts in digital media that emphasizes digital design theory and practice. The program provides students with the tools needed to pursue careers in animation, game design, and 3D modeling. This program is ideal for students who are passionate about digital arts and digital media. The CCNY community is rooted in the Lutheran heritage and fosters diversity, innovation, and leadership. Applicants are encouraged to contact an admissions counselor directly for specific program requirements. CCNY is regionally accredited by the Middle States Association of Colleges and Schools. Distance learners pursuing an online master's degree in film studies typically have considerable flexibility in tailoring their studies to their areas of interest. While program details vary among schools, the list below features descriptions of three sample courses commonly offered in film studies programs at the graduate level. Advanced film theory: This course examines theoretical models and approaches employed in academic analysis of film as a cultural medium. Topics may include authorship, cultural studies, reception studies, formalist and realist theories, postmodernism, and genre theory. Students may focus on one major figure, approach, or issue, and participate in film screening lab work. Advanced film history: This course explores major cultural, technological, and artistic trends shaping film history, and traces the development of film as an art form dating from the 1890s. Representative genre films are selected and screened in class. Topics may include historiography, film censorship, notions of cinematic realism, cinematic technique, film narrativization, and technological innovation. Documentary production workshop: Graduate students in this course gain a range of practical skills useful for the production of documentary projects. With a focus on collaboration, time management, professional ethics, and critical analysis, students acquire competencies in all phases of field production through experience gained in researching, writing, shooting, and editing documentaries. How Long Does It Take to Get an Online Master's in Film? Online master's degrees in film typically involve 36-45 credits and two years of full-time study. In exceptional cases, diligent students may accelerate their pace and complete a two-year program in three semesters plus one summer session. Some programs enable students to choose a coursework-only track or write a research paper or thesis, with the latter option extending degree completion time. While cohorts are not common in graduate level film studies programs, if you do choose a program structured around cohort learning, your studies proceed in tandem with your cohort, which graduates as a group. Individually paced programs may offer more flexibility in scheduling, enabling you to complete your degree sooner. Many programs allow you to undertake work in related disciplines so that you can specialize in an area of interest, such as African studies or scriptwriting. To ensure schools and programs meet proper standards of academic rigor and quality, they undergo a peer review process conducted by accreditation agencies. It is in your best interest to investigate the accreditation status of programs and schools you are considering, since federal financial aid is only available to students enrolled in institutions accredited by federally recognized agencies. Transfer credits, too, are generally only accepted for coursework completed in properly accredited programs. Regional accreditation, the most respected and popular designation, is handled by six U.S. regional bodies, one for each geographic region. National accreditation generally applies only to for-profit, vocational, technical, or religious schools. The National Association of Schools of Theatre conducts field-specific accreditation for programs in film studies and theatre arts. Another resource available to distance learners is the Distance Education Accrediting Commission, a private nonprofit organization specializing in recognizing distance education programs. Two agencies, the U.S. Department of Education (ED) and Council for Higher Education Accreditation (CHEA), oversee U.S. accreditation standards. The ED maintains a list of trusted accreditors, and CHEA maintains a comprehensive database of accredited educational institutions and programs recognized by one or both of these agencies. To help ensure that your online master's degree in film studies meets approved standards of quality and continual improvement, you can take advantage of these public service resources to verify the accreditation status of schools that interest you by searching the ED and CHEA websites. Salary trends can vary widely in the film industry. Note that experience and location can influence salaries just as much as educational background and specific job responsibilities. The table below features PayScale data regarding expected salaries for five practical and popular film-related professions at the early, middle, and late career stages. Careers in film are notoriously competitive, and graduates with a master's degree in film studies typically rely heavily on tenacity, resilience, and determination to succeed. Graduates typically focus their career paths around theoretical areas like history and analysis, or practical areas like directing, production, post-production, and distribution. Some graduates pursue teaching or postgraduate research in film. Experience, networking, and personal recommendations are critical for career success in all areas of the field. Film producers and directors supervise the financial and artistic aspects of film making. They interpret scripts and bring them to life in motion picture and television entertainment. Their duties include casting actors, selecting scripts, managing the work of assistants, determining budgets, hiring production teams, and securing distribution channels for films. Film editors work as technicians to fit pieces together, manipulate images, and cut unnecessary scenes to assemble a finished film. Their responsibilities include reading scripts and understanding the director's vision, working with sound editors, trimming film footage, and selecting scenes for dramatic entertainment value, performance quality, story continuity, and proper timing. Postsecondary film studies teachers instruct students in film theory, film history, and other related subject matter at the undergraduate and graduate levels. Their duties include classroom instruction and grading, developing research programs, supervising graduate students, and integrating interdisciplinary material. They also supervise research and publish scholarly material in the field. Graduates with film master's degrees often work in documentary journalism or screenwriting for feature-length screenplays. Film journalists may write reviews to report and inform the public while offering critical takes on film from theoretical and historical perspectives. They can work for magazines, websites, digital media, radio, and newspapers. Art directors hold responsibility for the design and overall visual style of a film, including factors like makeup, costuming, hair styling, color schemes, location aesthetics, and other visual aspects. They supervise the artists who develop concept art and layouts, and coordinate the artistic aspects of film production and editing. Students and recent graduates in film studies can join professional membership organizations to take advantage of networking opportunities, master classes featuring internationally recognized directors and producers, and awards events recognizing outstanding achievement in the field. Since networking is of particular importance to professionals in film studies, some organizations offer student internship opportunities and competitions. Scholarly interest groups are particularly useful for graduate students, as they feature a variety of opportunities for fellowship, support, and advocacy. Established in 1919 in Hollywood, ASC's mission is to advance cinematography and film as an art form. Members benefit from networking events, a master class education program, and an achievement awards program. ACE is a nonprofit organization focused on advancing film editing and the prestige of the profession. Member benefits include a student internship program, industry roundtable discussions, and an awards event. Founded in 1959, SCMS promotes scholarly understanding of film through research and teaching. Member benefits include an annual conference and scholarly interest groups, including a graduate student organization for support and advocacy. While funding a graduate education in film studies can seem daunting, your first step is to complete a Free Application for Federal Student Aid (FAFSA) to determine your eligibility for grants, loans, work-study programs, and other funding sources available through the U.S. government. You can also pursue scholarships and grants available through private sources, and apply for graduate fellowships available at some schools. To learn more about your options, review our resources below.